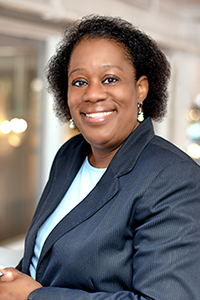 Doris Henderson Causey, of Richmond, is the Virginia State Bar’s new president. She heads a state agency that regulates and supports 50,000 Virginia lawyers. Causey was sworn in June 16 during the VSB’s Annual Meeting in Virginia Beach. She is managing attorney of the Central Virginia Legal Aid Society Inc.’s Richmond office. She served as the VSB Council’s 13th District representative from 2009 to 2015. She is a member of the Clients' Protection Fund Board and of the bar’s Budget and Finance Committee. Causey’s practice focuses on civil litigation, family law, landlord tenant, foreclosure defense, and poverty law. She is married to Tracy L. Causey and they have three children.